"I just gathered together my favorite fruits and added what else was needed. 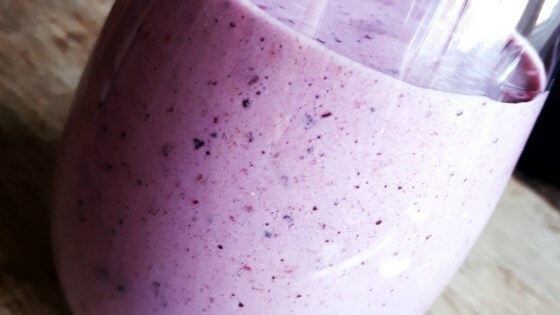 If you like, use a multigrain bar (I use Entenmann's strawberry flavored), crumble it, and sprinkle some on top of each smoothie." It was good. I used blackberries and strawberries instead of blueberries and cherries. I may add a little splenda next time or maybe more honey because it was a little bitter. These were great and you can use different kind of juice it you want it a bit sweeter instead of tangy try pineapple juice! I made this with a friend, minus the cherries, and it was delicious! We each had 2 cups. Drank them out of fun wine glasses & had a great time. Thanks! Delicious and refreshing! I too skipped the cherries, and used blackberries instead of the blue. Will make this all summer!